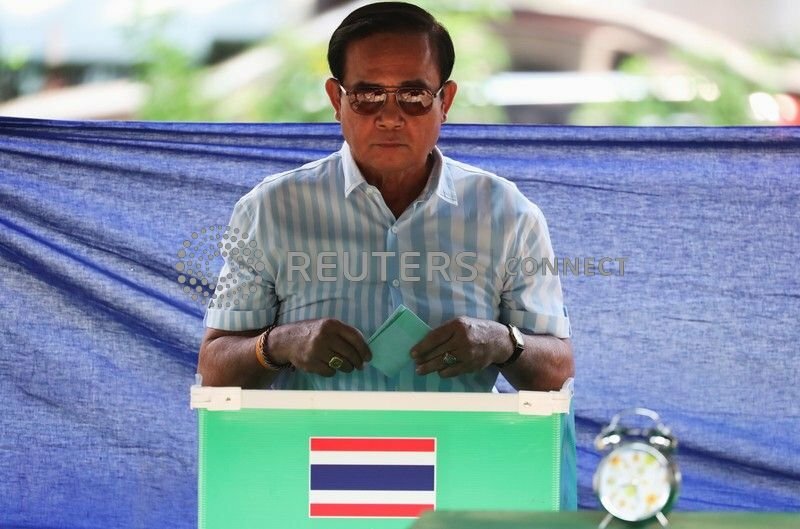 BANGKOK (Reuters) - Thai voters went to the polls on Sunday in a long-delayed election following a 2014 coup, in a race that pits a military junta chief seeking to retain power against a "democratic front" led by the populist party he ousted. Turnout was expected to be high among the 51.4 million Thais eligible to vote for the 500-seat House of Representatives, which will choose the next government along with a Senate that is appointed entirely by the ruling junta. Thailand has been under direct military rule since then-army chief Prayuth Chan-ocha overthrew an elected government linked to exiled former Prime Minister Thaksin Shinawatra, who himself was thrown out by the army in 2006. Critics have said a new, junta-written electoral system gives a built-in advantage to pro-military parties and appears designed to prevent the main Thaksin-linked Pheu Thai party from returning to power. Pro-Thaksin parties have won every election since 2001, but the past 15 years have seen crippling street protests that destabilised the government and hamstrung business. Junta chief Prayuth, whose party has campaigned on maintaining order and upholding traditional Thai values of loyalty and devotion to the country's monarch, appealed on his ability to keep peace as he made his final campaign appeal. "Before, we always had crises. We must not let those crises happen again - understand?" he told a closing campaign rally. The anti-Thaksin Yellow Shirts, mostly middle class and urban royalists who accuse his parties of corruption, have repeatedly taken to the streets, prompting the military to launch two coups in a decade. Supporters of Thaksin, known as the Red Shirts, also occupied much of Bangkok's main business and shopping districts for months in 2010 after a court dissolved a pro-Thaksin government, again paralysing commerce until a crackdown that left at least 90 people dead and saw landmark buildings burned. While the election results are due to be announced within a few hours of polls closing at 5 p.m. (1000 GMT), the make-up of the next government may not be clear for weeks afterwards, since no one party is likely to have enough seats for an outright win. "I think it's going to take a long time," said Paul Chambers, lecturer in political science at Naresuan University in northern Thailand. Good luck Thailand, i hope you can get back to some kind democracy. The Future Forward Party seem to have a very big following, especially with the younger Thai's. So are there any exit polls running? Is there anyway online to follow what's going on? It's barely lunch time on election day and I can't believe it, Prayuth Chan-ocha has won the election. Congratulations, who would ever guessed. And.... roll please. How about those international observers? Critic﻿s have said a new, junta-written electoral system gives a built-in ad﻿v﻿antage to pro-military parties and appears designed to prevent the m﻿﻿﻿﻿ain Thaksi﻿n-linked Phe﻿u Thai party ﻿from returni﻿ng to p﻿o﻿w﻿e﻿r﻿﻿﻿. Its glaring. If those who play fair overcome these horrible odds , military credibility will be diminished dramatically, and Thailand will be loved by the free world, like Malaysia. If the military wins while having handicapped those who play fairly, they still lack credibility, and will be rightfully to blame for all future problems. It is a crooked race, and even Steven100 would acknowledge that. It is a crooked race, and even Steven100 would acknowledge that. "﻿Before﻿, we always had crises. We must not let ﻿those crises happen again - understand﻿?﻿"
Spoken like a true Illiberal .. This guy who, would you believe, lectures in political science - at a University, no less - has finally got the message that we common-or-garden punters got as soon as we knew how the cards were stacked and how gloriously whimsical the junta appointed electoral regulating body is. That they - the Extreme Confusion (EC) - have been allowed to turn the election into an utter farce will have to go down as one of Prayuth's major accomplishments. Apart from that and holding 2-fingers up to 51.4 million adult Thais for the past 58 months, he's probably got nothing to worry about . . . well, nothing that a good dose of arsenic won't cure. This election is about as useful as the metal detector & guard at the entrance to a thai mall. And here's another reason why Prayuth may not really want to wake up to Monday, 25th March 2019 and it's all to do with those NIDA polls that he so cunningly arranged to boost his popularity. These will become his coat of many colours when he realises that, with each ego-greasing result, the resolve of the average Thai (including the cherry-picked 1,425 who were polled each time) to put this pretender where he belongs has become unstoppable. Question is, where does he belong? . . . Back at the barracks or, perhaps better for everyone, installed with other dinasaurs at the Natural History Museum.